Krishna Bharat, who founded Google News, announced the new feature on Tuesday. "The goal is to surface narrow and local topics specific to you. You can tweak by saying 'Not interested' until it's more to your liking. The topics and stories shown here will change with the news, to keep things fresh and serendipitous," he wrote. When you click on the News results, this means you'll see a new tab that says "Suggested for you" that will pull up a customized collection of stories. 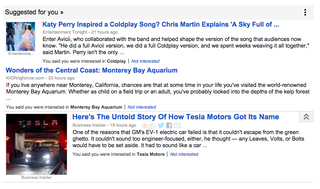 So this is basically an option to let Google curate a news roundup, which is cool. The more options for curated news roundups the better, I say! Google Now, Google's personal assistant program, provides custom breaking news updates. I've asked Google whether this Suggested Stories function uses a similar function to figure out what people want to see. Since the suggested stories are a value-add and don't affect the primary search engine, this is more of a bonus feature than a shift in how the company presents information, but it highlights the level of interest Google has in becoming an active filter for your news.